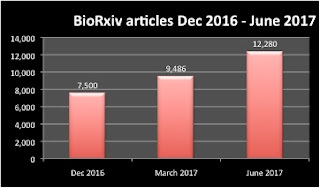 This edition of the Dramatic Growth of Open Access highlights two of the new kids on the OA block - SocArxiv and BioRxiv, modeled on early OA success story arXiv, topping the quarterly growth by percentage with percentage growth of about 30% each! 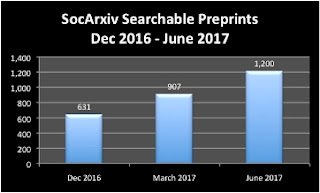 SocArxiv now has 1,200 documents and BioRxiv 12,800. To celebrate the growth of all OA services two pictures are presented of the growth of the largest collective OA search engine that I am aware of. 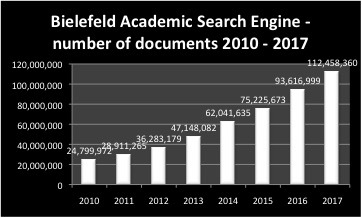 Together, the 5,000 content providers who contribute metadata to the Bielefeld Academic Search Engine (BASE) have made available over 112 million documents. 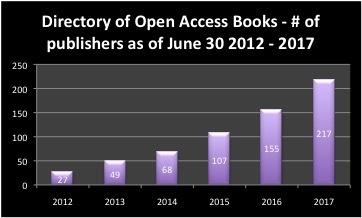 Around 60% of these are open access, so the number of OA documents in the world can be said to be somewhere about 67 million. 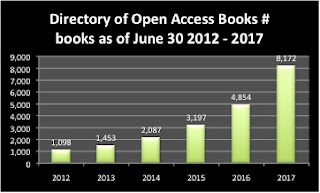 BASE also posts their own online statistics table and chart - check it out here. I wish I had the time to applaud and celebrate the growth of each and every OA service, but with 5,000 services contributing to BASE (and others that don't), if I worked on this 365 days a year I would have to cover 14 initiatives every day. So please feel free to help out by applauding and celebrating the services most relevant to you - the journals in your discipline, your institutional repository, the services you find most helpful to search.